Many of us probably remember the song “By the waters of Babylon, there we sat and wept”, sung by the Pop group “Boney M” some years ago. It was popular and swept the charts. It was inspired by Psalm 135. It recalls the lament over the destruction of Jerusalem and the pain and torment of exile of the people of God when they felt so forgotten that they were no longer able to sing; so they hung up their harps. The First Reading today brings us the sequel of that brutal time of the Babylonian exile. While they were in exile in Babylon the people of God felt a deep abandonment, a rejection. There was a silence over their plight and absence from Jerusalem. No room for joyous worship. But God is about to break his silence and revive their good name amongst the peoples of the world. He will give them a new name. Using marriage metaphors to indicate the closeness that intimacy with him, this restored people, will be as ‘a crown of beauty’, ‘a royal diadem ’my delight in her’, expressing poetically and in symbol God’s glory and proudest possession. In recent years the Irish Church and its people, have been through bitter times. We hurt deeply and are ashamed as the people of God. We ponder and wonder about the future, about our young. We may feel akin to those exiled in Babylon of yore. Reflection on these readings will help us realise that God never abandons. He is always there, constantly working for a restored/revived relationship of bridal beauty for the Church, his covenanted people. The relationship of God and the Irish Church is not fatally flawed. God will not remain silent. He will not abandon his own. This reading, one quite familiar to us, the image of the Church as Community, as a body of believers baptised into relationship with Christ and gifted to one another. The background to the Reading is of the Corinthian community not at peace within. There is squabbling and rivalry among them regarding the expression of some of these extraordinary gifts given to individuals in the community. Paul gives them, and us readers, an exhortation on the differing types of gifts, each one given for service or ministry in the community. Each is a gift of the Spirit for the community’s building up. They are not just natural gifts but gifts endowed on individuals in the Church or Parish for its wellbeing and growth. However diverse these gifts may be, they are bestowed for the building up of Unity among the people. We are told in the account of the Wedding Feast at Cana that this was the first SIGN that revealed who Jesus was. In turning water into wine he revealed himself. He was the new wine of the messianic age. The story is full of symbols from the Old Testament. The stone jars were for the purification of the hands and feet of the guests. 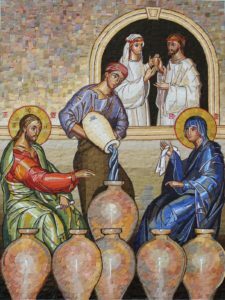 Turning water into wine, which is central to the story, offers a symbol of the old spiritual life of the Israel being brought to end. The old resources lack efficacy. Jesus is bringing something new – though he tells his mother ‘My hour has not yet come.’ The disciples received him, though their understanding of what he really means is still very limited. His mother must have been very close to the celebrating family as she was automatically, so to speak, at the centre of wedding, while her son was an invited guest, as were his disciples. As a close friend of the bridal family she noticed the “wine problem’’. Concerned she immediately contacted her son to help, as any mother would do. He was reluctant, telling her that his hour had not yet come. Was this some little understanding between them? He would not ignore his mother. She meanwhile primed the servants to be ready if he intervened. He turned the water into wine; ‘Jesus did this, the first of his signs, in Cana of Galilee, and revealed his glory; and his disciples believed in him. (5: 11).